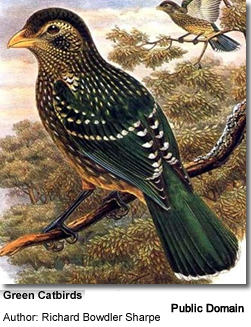 The Green Catbird, Ailuroedus crassirostris is a species of bowerbird found in subtropical forest areas along the east coast of Australia, from southeastern Queensland to southern New South Wales. Its name is due to its unmistakable call, similar to that of an angry cat, although it has also been mistaken for a crying child. 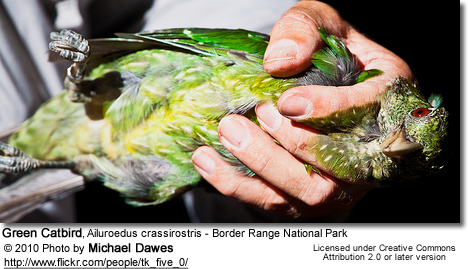 Its coloring is emerald green, with faint black markings on the face and white streaks on the neck. 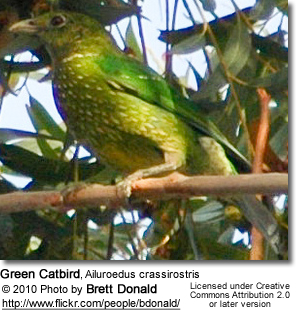 The Green Catbird is extremely similar to the Spotted Catbird, and are considered the same species by some. 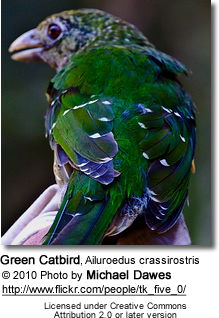 Green Catbird feeds mainly on fruit, flowers and other plants. They have been reported to feed their young with small birds or reptiles. The breeding season is from September to January. 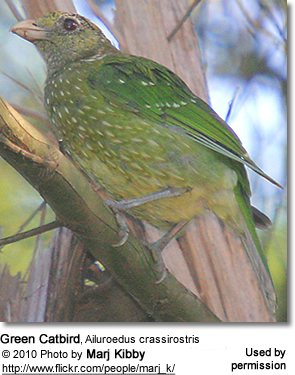 Green Catbirds pair monogamously, and the nests are noted for having an unusual layer of wet, soft wood beneath the lining of fine twigs and leaves giving it a large size. 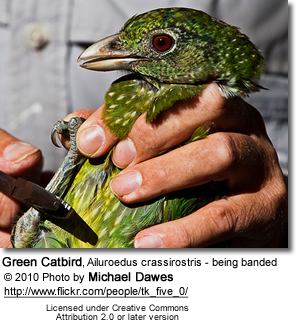 Widespread and common throughout its habitat range, the Green Catbird is listed as Least Concern on IUCN Red List of Threatened Species.